A lorry driver punched a taxi driver repeatedly in the face during a road rage incident after they crashed into each other in Leeds. A court was shown camera footage of Keith Chin jumping from his work vehicle and attacking the victim in the road. Eddison Flint, prosecuting, told Leeds Crown Court how the incident happened on February 1 this year on Butterly Street, Hunslet. Cameras from a nearby business captured the moment the taxi driver overtook Chin's lorry before pulling in front of him, causing the collision. 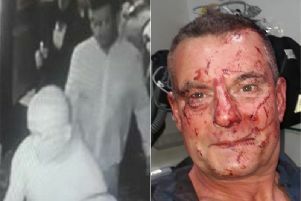 Mr Flint said Chin jumped from the cab of his vehicle and punched the victim around 10 times to his face as he got out of his taxi. Members of the public went to break up the disturbance. Chin was arrested and shown the footage. He told officers: "Jesus, that is not me at all." Mr Flint said: "It would appear that the red mist descended and it was a moment of madness." The prosecutor said the taxi driver suffered swelling to his face and nose but it was not clear whether any bones had been fractured. Chin, 37, of Longford Terrace, Bradford, pleaded guilty to assault occasioning actual bodily harm. Chin lost his job as a result of the attack. Paul Fleming, mitigating, said Chin had no previous convictions and had pleaded guilty to the offence at an early stage. Mr Fleming said Chin was under pressure in his personal life at the time. He described the incident as out of character for the defendant. Chin was given a four-month prison sentence, suspended for 12 months. He was also ordered to pay £300 compensation to the victim plus £170 court costs. Recorder Paul Greaney QC said: "You were involved in a thoroughly disgraceful incident. "The accident was entirely his (the victim's) fault. I am told you felt that you were under a degree of attack."